Location: Tyreso, Stockholm County, Sweden. 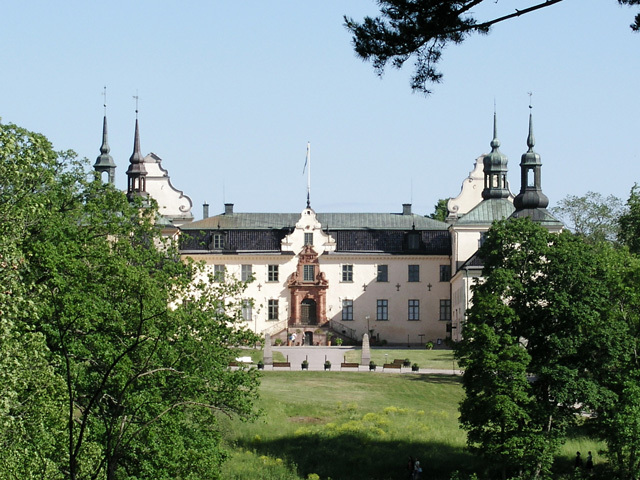 Notes: Tyreso Palace (Swedish:Tyreso slott) is a palace from the 17th century in Tyreso, Stockholm County, Sweden, about 25 km south-east of central Stockholm. The construction of the palace began in the 1620s by the Lord High Steward (Swedish: riksdrots) Gabriel Oxenstierna. The palace was completed in 1636. He also constructed the nearby Tyreso Church (Swedish:Tyreso kyrka), which was inaugurated with his own burial in 1641. The palace was inherited by Maria Sofia De la Gardie in 1648, who had married Gustaf Gabrielsson Oxenstierna, nephew of Swedish Regent and Lord High Chancellor Axel Oxenstierna. Both she and her husband's family were extremely wealthy. Maria Sofia resided in Tyreso Palace, from where she managed her estates around Baltic Sea, until 1694. Between 1699 and 1737, the writer Maria Gustava Gyllenstierna lived in the palace. During the 1770s the palace was modernized and the first English garden in Sweden was created. Planned by the garden architect Fredrik Magnus Piper, it is a mixture of an English park, a Swedish flowery meadow and picture out of a fairy tale - with the ancient forest as its ultimate source. The natural-appearing large-scale landscape gardens still exist today. Today Tyreso Palace is a museum. Marquis Claes Lagergren had purchased Tyreso Palace in 1892. Assisted by architect Isak Gustaf Clason, the Marquis rebuilt the castle, inspired by original drawings from the 17th century. The Marquis wanted the castle kept as a living document of Swedish history. He rebuilt large parts of the castle in a national romantic style. The marquis died in 1930, and in his will left Tyreso Palace to a museum foundation, the Nordic Museum (Swedish: Nordiska museet). Today the Nordic Museum owns the castle, and it is open for guided tours during the summer.